A game of two halves for Daniel Kelly, our newest Software Engineer and Semi-Pro Footballer! I graduated from Ulster University in 2015 after completing a 4 year Computer Science degree which contained a 14 month internship at Thales Air Defence. This work experience gave me an insight in to Software Engineering and I knew instantly this was the area that I wanted to work in. I was lucky enough to secure a Software Engineering role at Hewlett Packard Enterprise when I finished my degree. I spent 2 years there, where I mainly focused on the performance of the HPE storage arrays: developing new features, optimising IO speeds, finding data bottlenecks and implementing performance solutions. In this time I developed my knowledge of programming languages such as C, C++ and Python and my understanding of code path analysis and storage system statistics as well as mathematical data flow models such as the Markov model and Littles law. I knew that Belfast had a thriving start-up community and so I did some research as I was keen to get involved with a small company looking to grow, that’s when I came across Analytics Engines – a small company making big waves in the data analytics world. After reading more I decided I would reach out to see if there where any roles. I was disappointed to find they had no opportunities available. Then, less than a week later I got a phone call from a recruiter who described a company to me, the company sounded very much like the Analytics Engines I had read about, I asked them, “is this by any chance Analytics Engines?” and it was! I got a resume sent across as soon as I could and pretty quickly I got the job. The Software Engineering role I am in now allows me to take ownership of my projects, take them from start to finish and allows my creative and inventive instincts to flow. Since joining I have worked on mobile applications, web-based analytics dashboards, in-house tool kits and customer facing applications and platforms. Seeing your own creations being used to help grow and promote the company is the best thing about working at Analytics Engines. 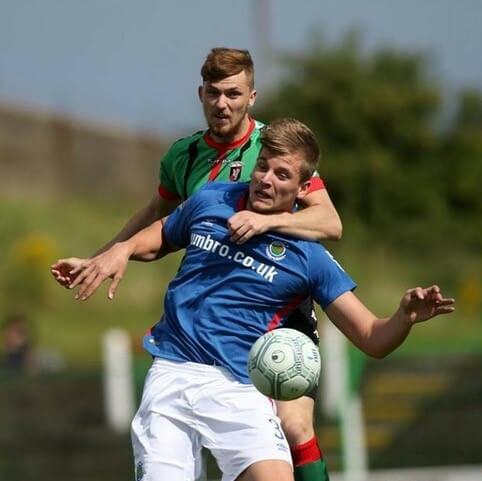 Outside of work, I play football in the Northern Irish Premier League for Glentoran FC. I have been playing football since I was 3 years old and has always been a huge part of my life. It has brought about some of my proudest moments such as international caps and major senior trophies. It does however involve a lot of training (pretty much everyday) whether it be on the pitch, in the gym or even the odd midweek game, Analytics Engines are happy to accommodate with flexible working hours.